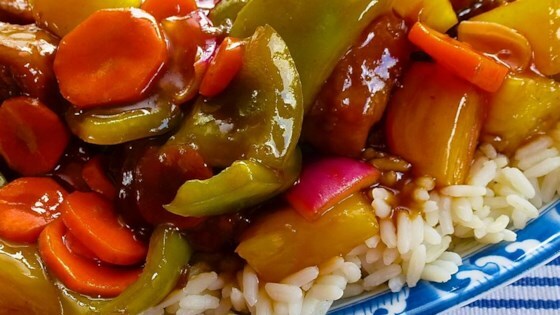 "Pork is stir-fried with peppers, carrots, onions and pineapple in this version of the classic dish. Easy to make, and delicious." Blend cornstarch and soy sauce in small bowl; stir in pork until well coated. Brown pork in hot oil in Dutch oven or large skillet over medium-high heat. Stir in 1/4 cup water. Cover and simmer 20 minutes, stirring occasionally. Stir carrots, onion, bell pepper and sweet & sour sauce into pork mixture. Simmer, covered, 10 minutes longer, stirring frequently. Add pineapple chunks; cook and stir only until pineapple is heated through. Had to change to sweet and sour sauce II from this site as I really do not like Kikkoman. great recipe. Fast and tasty. With vegies it makes a complete meal or I had a side dish of rice. Very easy to prepare. My family really loved this!!!! made this dish exactly as called for and it was fantastic. will be making this many more times.